"Which would you rather give your kids?" Is there a door number 3? Why would I want to give my kids horrific, heavily processed, lowest common denominator nutrition, food garbage? I love this ad though and truly admire their chutzpah. The ad's premise is simple. 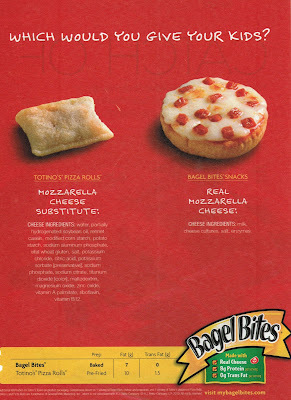 Totino's pizza rolls have lots of scary sounding ingredients in their cheese so you should feed your kids Bagel Bites instead. "Bleached Wheat Flour, Water, Mozzarella Cheese (Milk, Cultures, Salt, Enzymes)Tomato Puree (Tomato Paste, Water)Pepperoni (Pork, Beef, Salt, Spices, Water, Dextrose, Seasonings [Oleoresin of Paprika, Natural Spice Extractives, BHA, BHT, Citric Acid]Lactic Acid Starter Culture, Sodium Nitrate)2% or Less of: High Fructose Corn Syrup, Modified Cornstarch, Salt, Soybean Oil, Yeast, Whey Protein Concentrate (Milk)Nonfat Milk, Flavor Enhancer (Potassium Chloride, Ammonium Chloride, Yeast Extract, Maltodextrin [Corn]Lactic Acid, Citric Acid, Calcium Lactate, Natural Flavor)Methylcellulose, Citric Acid, Red Pepper, Natural Flavor, Dough Conditioner (Ascorbic Acid)Enzymes. Oh, and guess what. Bagel Bites have 21% more sodium and 250% more sugar than Totino's Pizza Rolls. 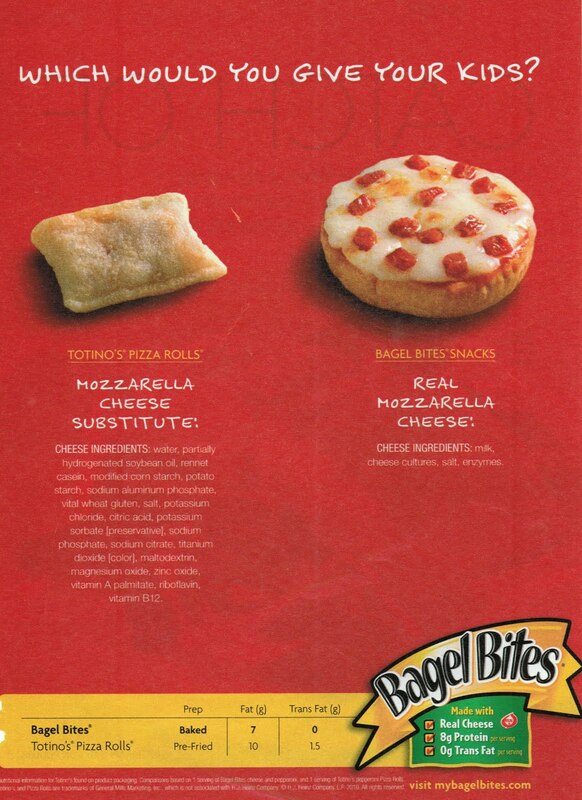 Of course making an argument that Bagel Bites are better to give your kids than Totinos or vice-versa is like making the argument that it'd be better to get kicked in the nuts than get punched in the nuts. Don't buy your kids either!